The western part became the Mark Turin in the 11th century and this came under marriage through marriage Savoy, Piedmont and thus also viticulture was under French influence for many centuries. 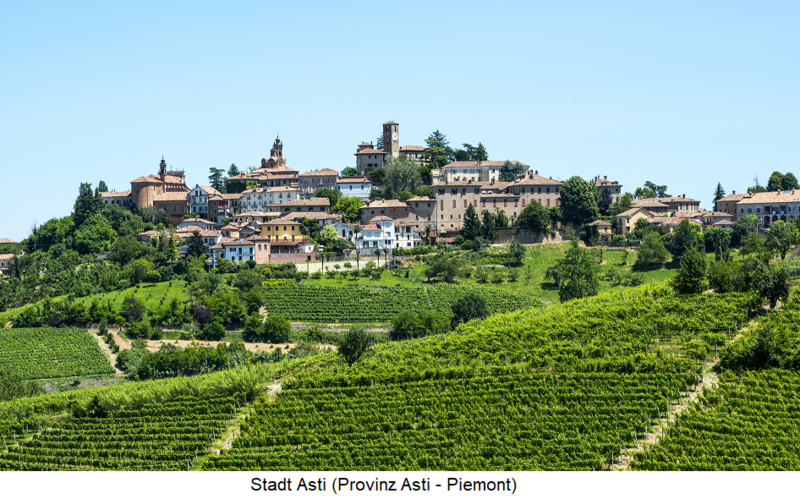 In the middle of the 13th century, the name "Piedmont" was first used, which is derived from the French Pié de monte (at the foot of the mountains). The Piedmontese vineyards are located mostly at the foot of the Alps and Apennines on both sides of the broad upper Po Valley. Only in 1815 Piedmont was annexed to the Kingdom of Sardinia and finally came with this together in 1861 to the United Kingdom Italy. The vineyards cover 47,500 hectares of vineyards. A large part lies in hilly area in sun-rich slopes, The most important winegrowing areas are Asti, Carema, Canavese, Caluso, the mountains of Vercelli and Novara and the highest quality hills of Monferrato and Langhe at Alba. There are well over a hundred approved grape varieties (in the 19th century there were even just under 400), many of them are autochthonous, The most important white wines are Arneis. Chardonnay. Erbaluce. Cortese, Favorita ( Vermentino ), Moscato or Moscato Bianco ( Muscat Blanc ), Pinot Bianco ( Pinot Blanc ), Pinot Grigio ( Pinot Gris ) and Sauvignon ( Sauvignon Blanc ). This page was last modified at 24 September 2018 at 19:50.